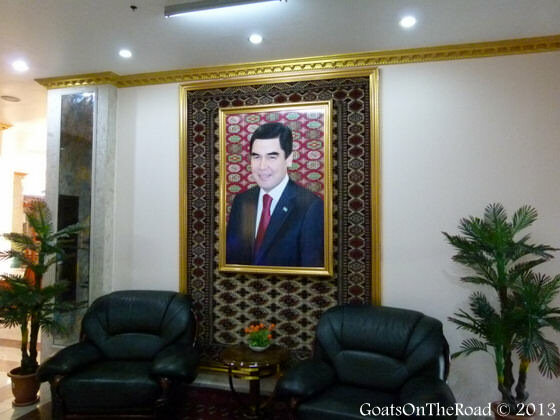 Turkmenistan is a country that is hard to get in to and is cut off from the rest of the world. If you want to stay for more than 5 days, you have to join a tour and be with a guide the whole time. Otherwise, you’re only allowed to transit through. The current and former presidents brainwash the citizens with false information about the world and their history, monitor everything on the internet and plaster pictures and statues of themselves all around the country. It’s a bit like North Korea actually. So why did we want to come to this country? Because we wanted to travel all the way from China to Iran by land. We got a 5 day transit visa when we were in Dushanbe, Tajikistan and planned to just see a couple of major sights and leave. 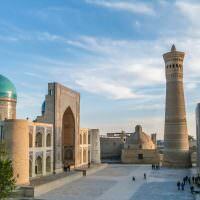 After a fabulous 2 weeks in the architecturally blessed country of Uzbekistan, we were on our way to Turkmenistan. I think border-crossing days are always dreaded by travellers, at least in this part of the world they are. It always takes longer than expected and anything and everything could go wrong. 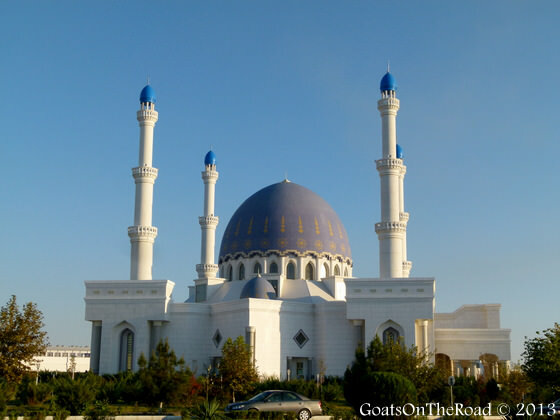 For us, entering and exiting Turkmenistan were probably our worst border crossings ever! 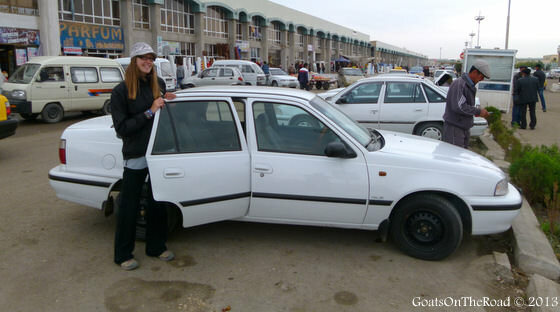 We arrived at the border after shared taxi ride (which is the typical mode of transportation in Central Asia). We walked to get our exit stamp from Uzbekistan, which was fairly easy and went smoothly. In between borders with Uzbekistan and Turkmenistan, there is about 10kms of “no-man’s land”, but yet there were no taxis to take us to the border. So, we started walking. Luckily after about 10 minutes a man drove by and picked us up. At the border, we showed our passports to the guard, who sent us to a medical check room. I was remembering the time at the border with Tanzania and Kenya and was praying we didn’t need to get some border-crossing vaccination! Luckily, we just had to fill in and sign a paper, stating who knows what – everything was in Russian so we just had to take the word of our new friend who picked us up. He translated and we signed it. We then waited in line to show our passports again and get our stamp into Turkmenistan. We had to tell the grumpy men behind the counter which hotels we were staying in. So, we chose a couple from the Lonely Planet (both of which we hadn’t booked yet). He then said to wait and that they had to call to confirm these were actual hotels. Fast-forward an hour later and we’re still there waiting for this alleged call to be made. Finally we got the go ahead and were sent to a window to pay a $12 entrance fee into the country. A fee for what? I’m not sure. We then had our bags searched, handed in the form we had filled out before and finally made it through the doors. We took an overpriced shared taxi to a nearby town where we then switched taxis to take us to the city of Mary. We searched all over Mary for a homestay that was supposed to be there, but it ended up being closed. We finally decided to just get out of the taxi and go and eat something. By this time it was 5:00pm and we had been on the road with just snacks since 8:30am. Needless to say, we were starving and Nick was starting to get grumpy. We eventually found a hotel that was outside of town, but no one there spoke English. The following morning we decided we should set off to see the ancient site of Merv. The sky was black and so were our moods. Our guidebook didn’t tell us how to get to Merv and since no one in Mary apparently speaks English, we had no clue where to go, or what to do. We finally figured out that there was ONE state-run (and monitored) internet cafe in the city. We went there and looked up how to get to this ancient site. By this point, it was raining and we just wanted to leave. So, we came all the way to Mary to see Merv, but ended up seeing nothing but a restaurant, our hotel and an internet cafe! Things during the rest of our time in Turkmenistan didn’t get much better either. It’s a good thing we only had a visa for a few days. Stay tuned to hear about our (mis)adventures in Ashgabat, Turkmenistan’s capital! 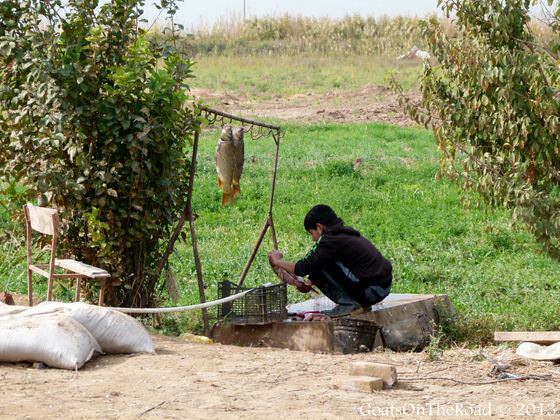 Have you ever had border-crossing issues or been to Turkmenistan? Tell us about it below! Crazy Turkmenistan. Sounds weared and strange. Apparently , China is a more great country. Yes, in our opinion, it was a very strange place. We much preferred China! Even in 21st century how can an entire country be so weird God knows! Did you think it’s a safe place to travel alone? Yes, I do. We felt safe there, it was just a strange place!